Dr Michelle Ellis speaking to a group of young women about the Girls' Programming Network. 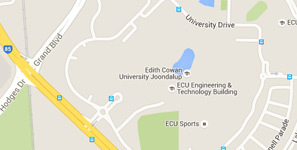 ECU is proud to be a member of the SAGE Pilot of the Athena SWAN charter in Australia. This initiative promotes gender equality and encourages opportunities for girls in STEM. 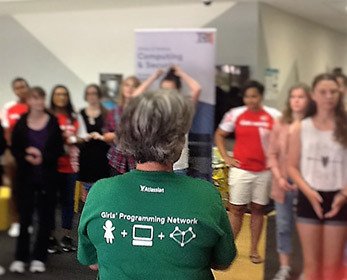 The Girls' Programming Network (GPN) is a program developed and run by girls and for girls. Managed by a group of female IT students from ECU, it's targeted at high school girls in years 7-12 interested in IT, particularly those interested in learning to program or improving their software development skills. One Saturday each school term, the School of Science run a workshops with activities teaching coding both on and off the screen. Topics we explore range from decision trees to logical processes lead into coding with Python. GPN is an unique opportunity to meet new friends with similar interests, find mentors, and find out about university life. Female industry partners will also engage with our program to mentor and inspire girls towards STEM careers. Term 1: Saturday, 9 March 2019, register here. Term 2: Saturday, 11 May 2019, register here. Term 3: Saturday, 10 August 2019, register here. Term 4: Saturday, 2 November 2019, register here. For more information, contact Michelle Ellis.